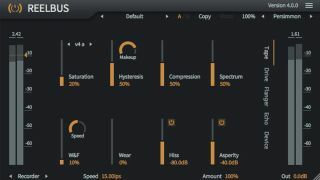 ToneBoosters has busted out an update to its ReelBus plugin, with version 4 bringing together tape recorder, flanger and echo simulations. Tape saturation models from previous verions of ReelBus and Ferox are included, while the echo, flanger and tape-stop simulations are all new. There’s also a Drive EQ that enables you to drive the tape simulation in a frequency-dependent manner. You get dedicated controls for tape saturation, hysteresis, compression and spectral effects, while accurate wow-and-flutter, tape wear, hiss and asperity simulations are also promised. You can grab ReelBus 4 now for €20 - regular price is €30. It’s available for PC and Mac in VST/AU formats on the ToneBoosters website.